Millions of people around the world use hydrotherapy (HT). Such widespread use, especially in South America, East Asia and Africa, has led to increased professional and public debate across the world on HT as a form of healthcare. In the main European Countries, HT training is incorporated into medical curricula and HT treatments are provided by national healthcare systems. However, commonly accepted definitions of HT therapies and products are yet to be established. FEMTEC (www.femteconline.org) is one of the most representative medical thermal HT associations, having been founded in 1937. It has official working relations with the World Health Organization (WHO). Together, they develop programmes using natural resorts for therapy and health. FEMTEC is a co-promoter of the WHO-GARD (Global Alliance against Chronic Respiratory Diseases) international programme (www.who.int/respiratory/gard/en/). 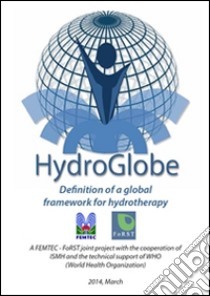 The Federation maintains close contacts with international medical hydrology associations like ISMH (International Society of Medical Hydrology, www.ismh-direct.net), universities and ministries of health in different countries. FoRST (www.fondazioneforst.it ) is the Italian Foundation, established in 2003, for scientific research on HT. It provides funding for scientific research in hydrology and balneotherapy. FoRST is practically the sole provider of funding for research in this research area in Italy. FoRST recently redesigned its own system for evaluating scientific projects. As such, to ensure funding goes to the best projects, the decision was taken to follow standard, internationally-recognized project evaluation procedures using external experts as peer reviewers. Even if HT is growing and ever more widespread, there is still a significant lack of data in this field, no list of the different types of HT and the definitions have not yet been finalized. In addition, the legal status of these therapies and the training programmes vary drastically from country to country. There is still no international assessment of the use of this kind of therapy.